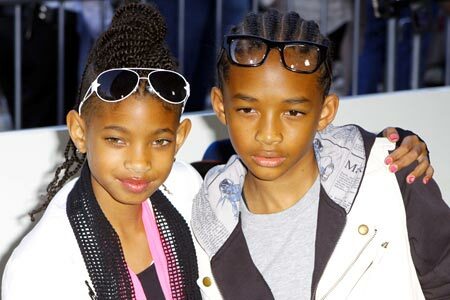 Willow and Jaden Smith Fashion Lines? *Will Smith’s children Jaden and Willow may soon have their own fashion line in stores, according to Rihanna’s stylist Mariel Haenn, who is teaming up with the famous siblings to develop a signature style. Mariel also believes Willow has similarities to her other client Rihanna – who is well known for her offbeat style. kid or no kid, “offbeat” is an understatement. They’ll be like the Olsons twins…good luck. Yeah! I bet little Miss Willow is vocal about her fashion sense. LOL Anywhoo, everyone else has a clothing line so why not Jaden and Willow. They are nice looking kids. I hope they keep their heads on straight about the whole fame and fortune game. PS. Willow, regardless of someone else’s style, I hope your line of clothing actually look like clothes and not the skimpy, skanky stripper type. i think they’re real cute but yoter medai, enough. i’m not really n2 child celebritism. seems unatural 2 me….takes kids out of their natural cycle. afterall only have 18 yrs 2 b a kid. Hope they get good grades and plan to go to college. It kind of seem’s like hollywood is more important. I hope I’m wrong on this. Spare me. I love Will — and I tolerate Jada since she married Will. I think Jaden has matured into a fantastic little actor and I have no doubt he will be a superstar. Now, Willow … do you remember when Will said years ago that Willow wanted to be like Paris Hilton — famous for nothing. Well, it’s happening. I saw the fashion photos from this shoot, and she should find her real niche since it’s NOT modeling or fashion.. Try as hard as she might, her fashion is not aesthetic. It can be interesting, but it seems too contrived to be authentic. Why would someone buy her fashion? Why do she and Jaden have the expertise in fashion to put out new lines? Makes no sense. But I’m sure the sheep will purchase. Now, I do like Jaden’s style when it comes to hair. His hair is always awesome. Willow seems like she’s really trying to fit in somewhere, but she needs to put in the work and let her talents mature instead of forcing them on the public prematurely just because she has access and famous parents. This is fame abuse. LOL. “”Jaden is [like] Johnny Depp,” Smith says. “He just wants to do good work . . . He loves acting, he just wants to make good movies.